Apple made good on a promise to ship out Apple TV development kits to select developers this week, as some who were selected to take part in the early access program received their kits on Tuesday. Source: Caleb Thorson via Twitter. 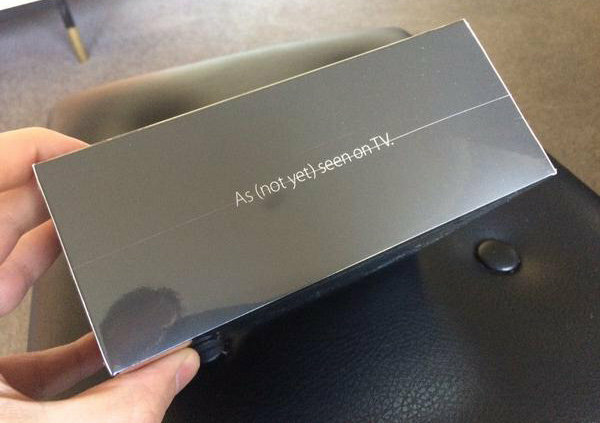 Developer Caleb Thorson posted a picture of his Apple TV dev kit to Twitter in what is expected to be the first of many unboxings, first looks and comprehensive rundowns of Apple's next-generation streamer. An unboxing video somehow hit the Web last Wednesday, just hours after Apple announced the device onstage at Bill Graham Civic Auditorium in San Francisco. Apple only yesterday informed developers selected to take part in the early Apple TV access program that their units would begin shipping later this week. The dev kits are being parceled out to facilitate quick turnaround on Apple TV apps ahead of the set-top box's public launch in October. The chosen few were charged a $1 fee for the opportunity. Introduced at Apple's special event last week, the new Apple TV sports runs a specialized operating system called tvOS that features a dedicated App Store, streamlined user interface and advanced search functions. With a powerful A8 SoC and included touchpad Siri Remote, the diminutive black box also integrates voice control. The remote boasts motion sensors for gaming and intuitive control over third-party apps. Apple's fourth-generation Apple TV launches sometime in October with a starting price of $149 for an entry-level 32GB model, while a 64GB variant will cost $199.